Follow signs for town centre then pick up Aire signs on way out. Large aire on the outskirts of the touristy village of Coulon. Overnight parking is €6 collected each morning by the tourist info office staff. Motorhome service point free. Extended parking area, with camper vans also using the large car park at the end. Toilet block included and right next door to the waterways of the Venise Vert. The area is well maintained with well trimmed grass lawns. The main Tourist Office is on the river side at the rear of the Aire approx 300 mtrs away. 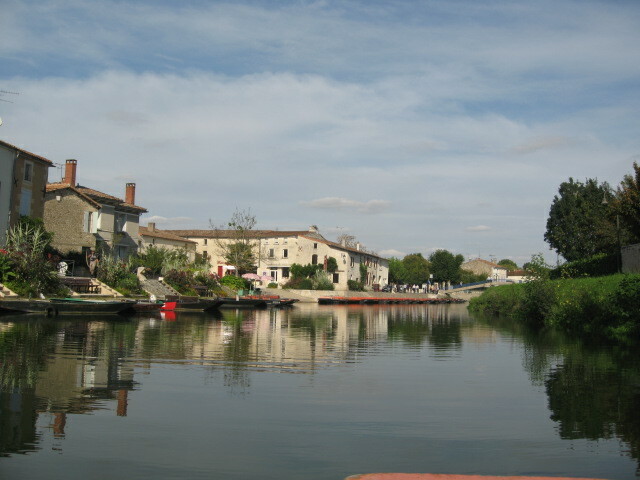 Cost per 24hrs: Coulon, reported as one of the prettiest villages in France. Venise Vert or Green Venice The whole town exists by hiring punts to visitors so they can row through the maze of canals that form the major part of this area. Punts can be hired from around €18 per session, the more the better as you are paying per boat. You can also have a guide that will row you around the canals for an extra charge. Be sure to take the map with you as the canals can become confusing if left to wander on your own.